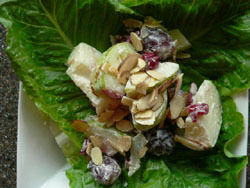 Fruit salads are fun and This is a great apple Waldorf salad recipe. I serve this salad as a side dish with ham roll ups. It makes for such a nice light lunch. Try taking it to your next pot luck as a dessert. After all the food, this is a welcome surprise. Cored and cubed apples into bite size pieces, sprinkle the lemon juice on the apple and mix in the celery and grapes. In a medium sized bowl, mix together the mayonnaise, sugar, salt and pepper. Pour over apple mixture. Chill for an hour before serving. When ready to serve, sprinkle the nuts over the top of the salad. Makes about 4 servings. Tips: Easy to make this fruit salad dressing for the calorie conscious dieter in the family. Substitute with light mayonnaise or use 1/2 mayonnaise and 1/2 yogurt. The nuts can be any variety such as walnut, pecan or almonds. What ever one you use, do roast them before adding to the salad. Roasted nuts have a wonderful nutty favor. You can roast in the oven on a cookie sheet at 400 degrees or on the stove top in a non-stick pan. Either method, keep your eyes on them, and move the nuts around a bit now and then so as not to burn in spots. I like stove top the best, easier to stir and keep an eye on them.